We’re happy to celebrate 100 YEARS of Christian Science services on March 5, 2017. 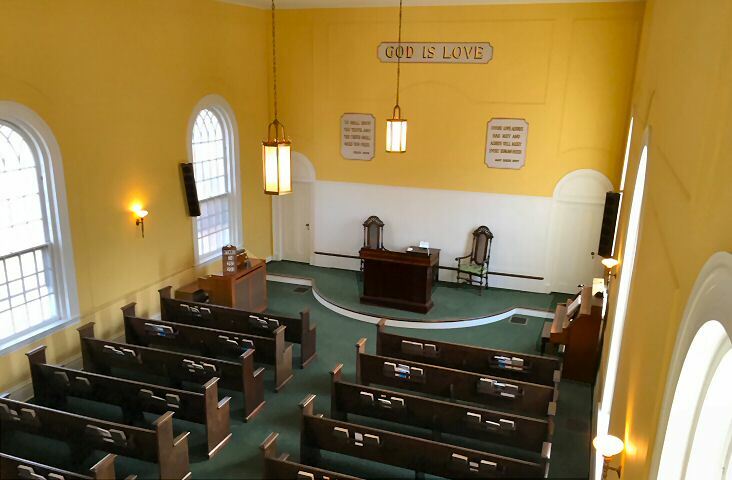 Built in 1830 as a sea captain’s home, it was renovated to be our church 87 years later.Â Henry Bacon, designer of the Lincoln Memorial in Washington, D.C., and consulting architect at Wesleyan University, advised on the reconstruction. Everyone is welcome at all of our services & activities! You are welcome to attend our Sunday service, with Sunday school for children up to the age of 20 held at the same time. Children too young for Sunday school are cared for in our nursery. 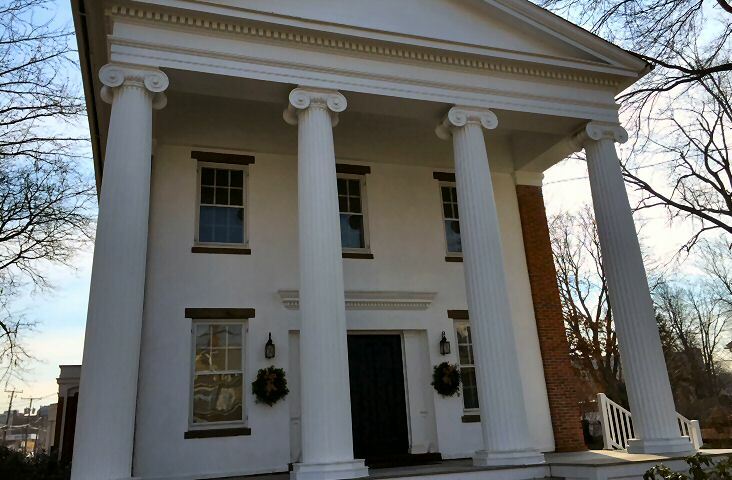 Our Sunday school entrance is on Broad Street. Church and Sunday School are at 10:30 A.M.
A Wednesday evening testimony meeting is held in the Reading Room at 6:30 P.M.
What Should I Expect At A Christian Science Church Service? Two members conduct the service and read the Bible Lesson Sermon from the Christian Science Quarterly. The congregation sings three hymns. Silent prayer is followed by The Lordâ€™s Prayer.Â A beautiful solo is sung. Brief selections are read from the Bible andÂ Science and Health with Key to the Scriptures, by Mary Baker Eddy.Â The topic is based on current concerns and how to spiritually solve them. The congregation sings three hymns, prays silently and then prays the Lordâ€™s Prayer out loud.Â After a hymn, everyone is able to share how they have used Bible-based truths to heal needs in their own lives, proving the practicality of prayer. 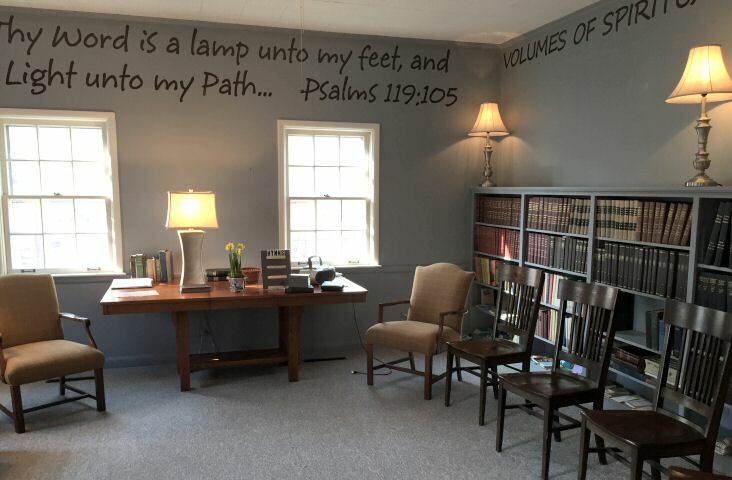 We hold this meeting in our Reading Room at 63 Broad Street. 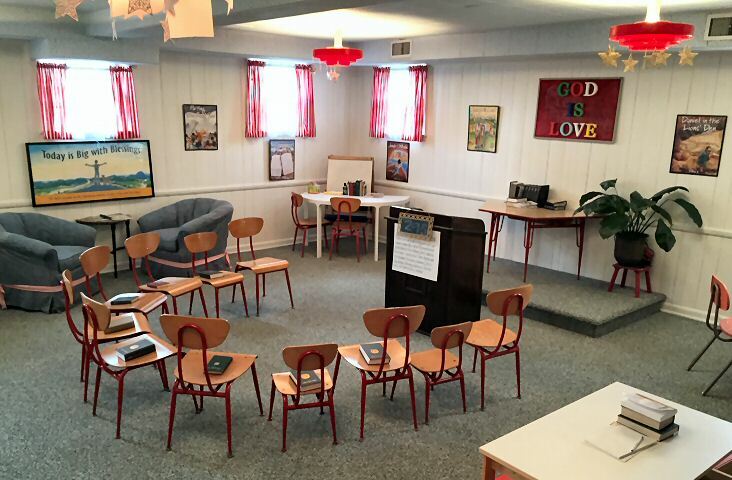 After singing the first hymn with the church congregation, the teachers and students go to the Sunday School for their own opening exercises which include a Responsive Reading from the Bible, silent prayer and The Lordâ€™s Prayer. Students are taught age-appropriate lessons based on the 10 Commandments, the Beatitudes, and Bible stories.Â They also learn how to use the synonyms for God as Life, Truth, Love, Spirit, Soul, Mind, and Principle, (given in Science and Health) to pray for themselves, their families, school, and community. Students up to age 20 are welcome!Â Sunday School is at the same time as the church service–10:30-11:30. The entrance is atÂ 63 Broad Street. The Reading Room is a public bookstore. 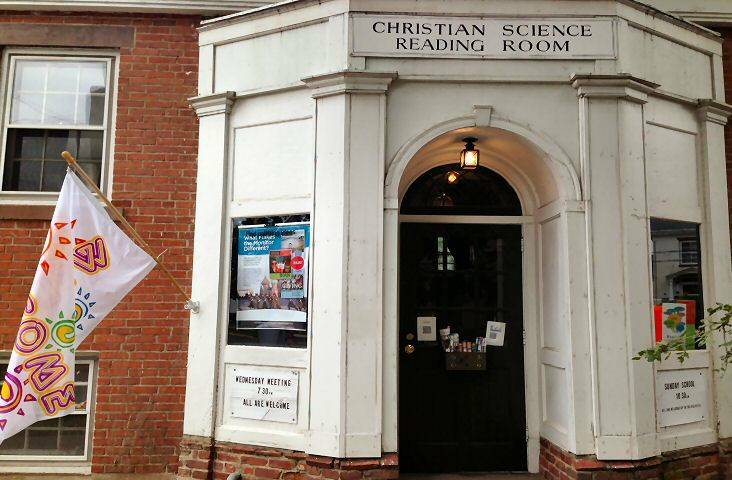 Bibles, Mary Baker Eddyâ€™s writings, Bible Lessons, inspirational magazines-the weekly Christian Science Sentinel, the monthly Christian Science Journal- and the Christian Science Monitor Weekly news magazine are for sale. CDs and childrenâ€™s books are stocked as well. A lending library and many reference books are available for spiritual study. The Reading Room is open before and after both services and by appointment. We are engineers, teachers, designers, care-givers, business people, college professors, coaches, lawyers, and maintenance workers–all yearning to know God as omnipotent Love as promised in the Bible.Â Weâ€™ve found Mary Baker Eddyâ€™s book,Â Science and Health with Key to the Scriptures, to be the best guide to understanding the spiritual meaning of the Bible. This spiritual understanding, based on divine law, brings healing to every human condition. Christian Science was discovered by Mary Baker Eddy, a devout Christian woman from New England.Â When a doctor told her she had no hope of recovery after an icy fall, she turned to her Bible.Â Through her prayers to better understand Christ Jesusâ€™ healing work, she was inspired to get up and walk out of her room.Â As a result of this healing, she discovered how Godâ€™s laws healed and sustained her. Mrs. Eddy healed poverty, discrimination, hunger, homelessness, sickness and personal defamation based on her discovery. Thanks so much for visiting and we hope to see you soon. Open before and after the church services.